Tutor Mentor Institute, LLC: Follow up to NY Times series "Race/Related"
Follow up to NY Times series "Race/Related"
Browsing my email today and opened the link to message from New York Times, pointing to a series of articles under a "Race/Related" topic. In this issue they were highlighting violence in Chicago, and a "One Weekend in Chicago" photo/journalism project. I'm going to send the link to this blog back to the Times. I hope readers will share it with others, including leading philanthropic organizations in Chicago and other cities. First. This is not new. I included this 1993 Chicago SunTimes article in a story I posted in April 2015. I highlighted sections at the beginning of the article focusing on the lack of a "master plan" and at the end, showing that while many were doing something, too few were coordinating their actions, and their funding, with others. 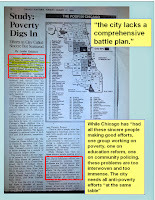 I highlighted this story partly because it include a map showing poverty neighborhoods in Chicago. 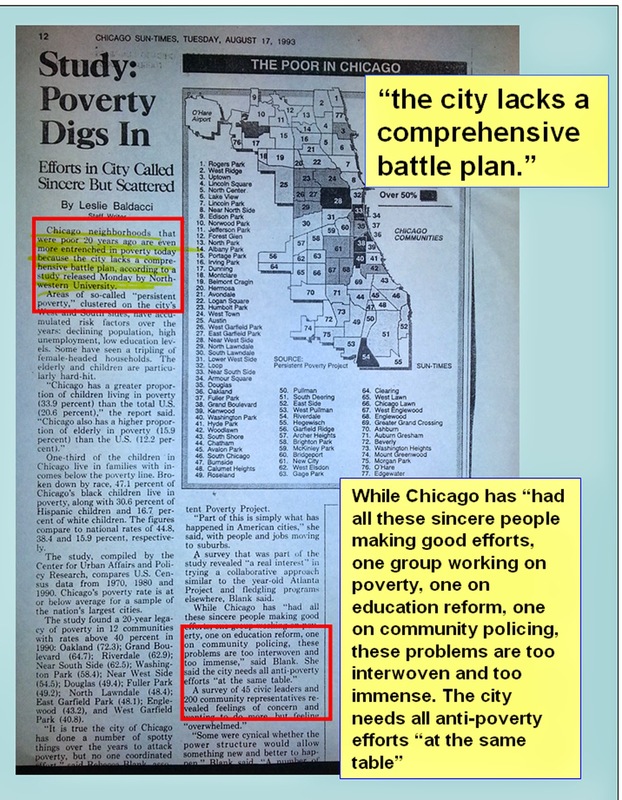 These are areas where a consistent flow of talent, dollars and resources could have been building mentor-rich, non-school tutoring, mentoring and learning programs, borrowing from examples of effective programs already working in Chicago and other cities. I re-emphasized this in a story I posted last November, following two more high profile killings of young people in Chicago. As with many stories I've written since starting this blog in 2005, I've used maps to focus on neighborhoods where people need more help. Since 1998 I've used stories on the MappingforJustice blog to illustrate uses of maps. I've offered a Master Plan since 1994. 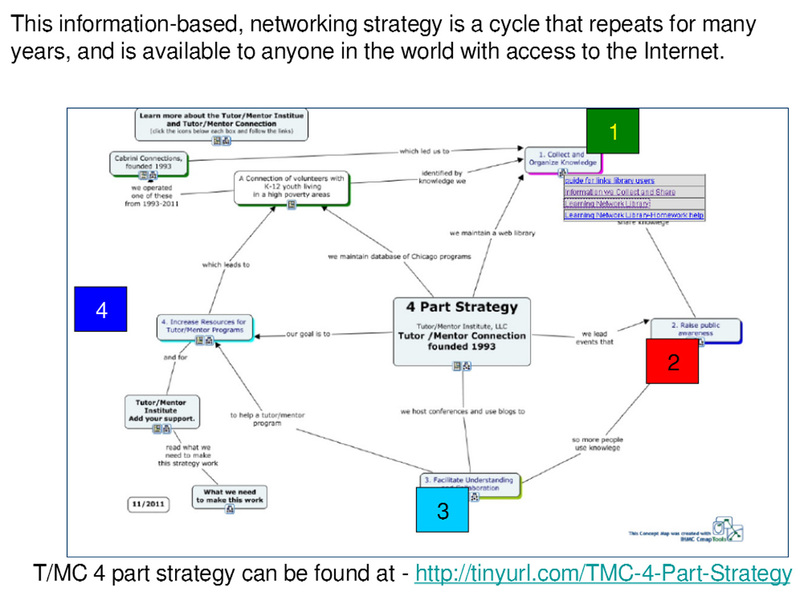 I started the T/MC in 1993, and included a map-based strategy from the very beginning. 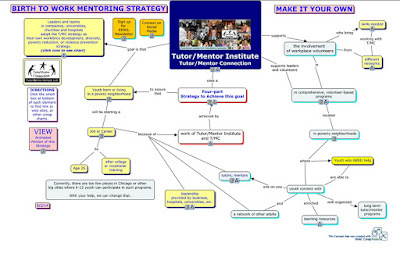 Below is a handout distributed at the first Tutor/Mentor Leadership and Networking Conference, in May 1994, showing the strategy I was trying to find support for. I was never able to get support from many of the foundations in Chicago, and the support I did receive was small ($1,000 to $25,000), often restricted, and often only lasted for one to three years. Since 1994 I've narrowed down the 10 point in this document to four concurrent strategies that I feel need to be supported in Chicago by leaders from business, government, philanthropy, media, etc. This PDF provides an overview of these four steps. This map is part of a set of concept maps that have been created since 2005 and can be viewed here. 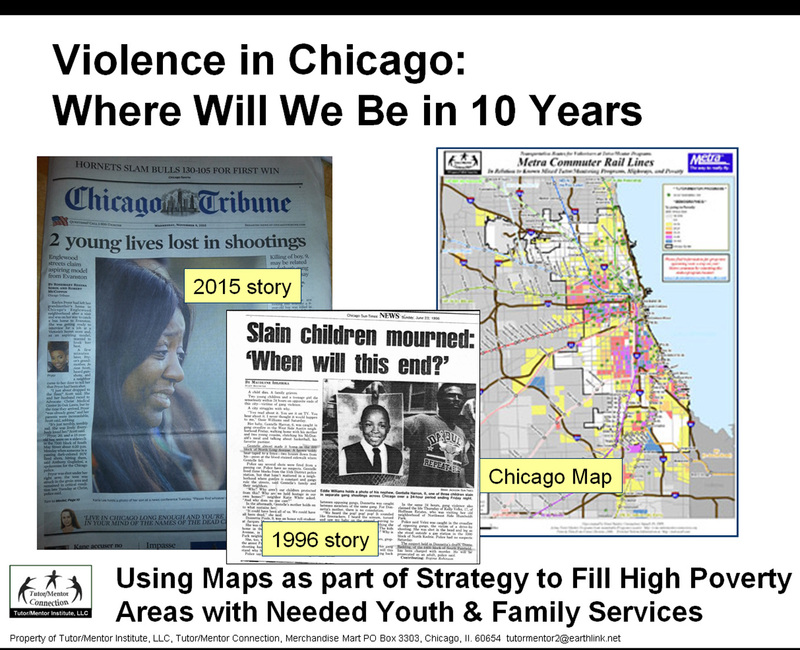 The first map in that series shows a commitment that leaders throughout the Chicago region need to adopt. All the other maps, and the extensive library of information I've aggregated since the early 1990s, can be found by following the links at the bottom of the nodes on this map. I created this concept map as a learning guide, for those who want to systematically build their own understanding of the ideas and strategies I've been sharing. 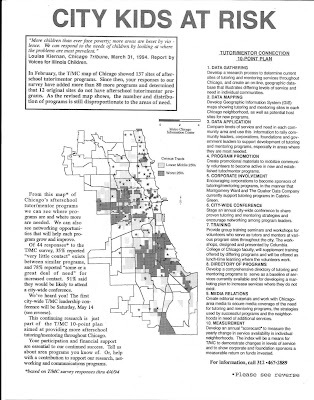 This is a 1995 Chicago Tribune story focusing on the T/MC "Master plan"
This is one of many stories posted in the 1990s and throughout the 2000s. As the Internet became more of my strategy my web sites have recorded more than one million visitors since 1998. 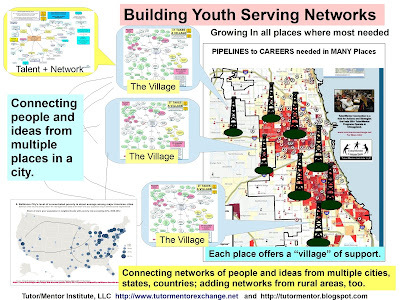 I've been sharing these ideas with leaders in Chicago and other cities for more than 20 years and while I've had some support (raising over $6 million from 1994-2011, split between the Cabrini Connections youth program strategy and the T/MC strategy), I've not been able to maintain consistent support on a year-to-year basis, and never had more than $175k to support T/MC activities in the third larges city in the USA. This comparison of the T/MC to other intermediaries was done in 2010. 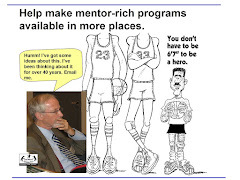 The challenges I've faced, are similar to challenges all small non profits face, which you can read about in the articles in this section of the Tutor/Mentor web library. 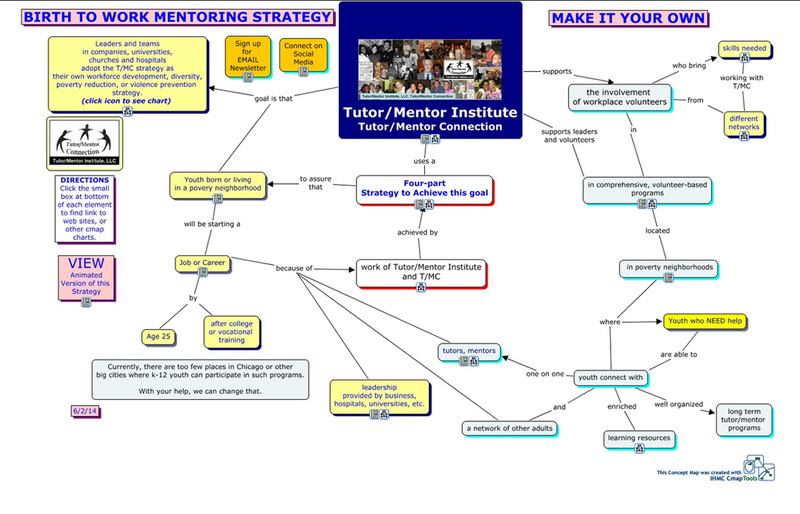 I've visualized the strategies of a Tutor/Mentor Connection (which I'm now keeping alive via the Tutor/Mentor Institute, LLC). This shows how intermediaries like myself are supporting actions by different people and organizations. 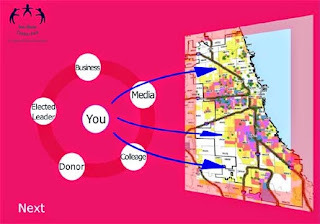 This shows a fundamental goal of helping organizations in every high poverty area of the Chicago region get the consistent flow of dollars, talent, ideas, technology, etc. that each needs to be constantly improving their impact on the lives of young people ...and of the volunteers who become personally involved through organized tutoring and/or mentoring programs. This was the focus of the strategy launched in 1994 and it's still a strategy Chicago and other cities need as we move through 2016. I hope reporters at the New York Times will spend as much time researching this as they do telling photo stories about the human tragedy that is taking place in Chicago and other cities. Too much information? Not sure what these graphics are telling you? Why not create a youth research project, where young people spend time looking through my blog articles and visualizations, then create their own interpretations for adults to look at? The graphic above was done by an Intern from South Korea. It's one of many intern visualizations that you can see at this link. This wiki page outlines a strategy waiting for partners and sponsors. This is a complex problem that requires sophisticated, on-going, and long-term solutions. 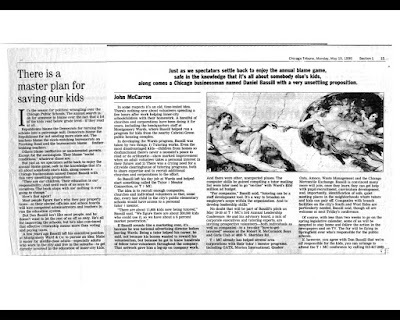 We'll be reading stories like the ones being shared by the New York Times 20 years from now unless a few leaders step forward to support strategies like I've offered since 1994. Due to the changing support I've received from 1994-2011 the Tutor/Mentor Connection was discontinued as a strategy of the Cabrini Connections program in mid 2011. 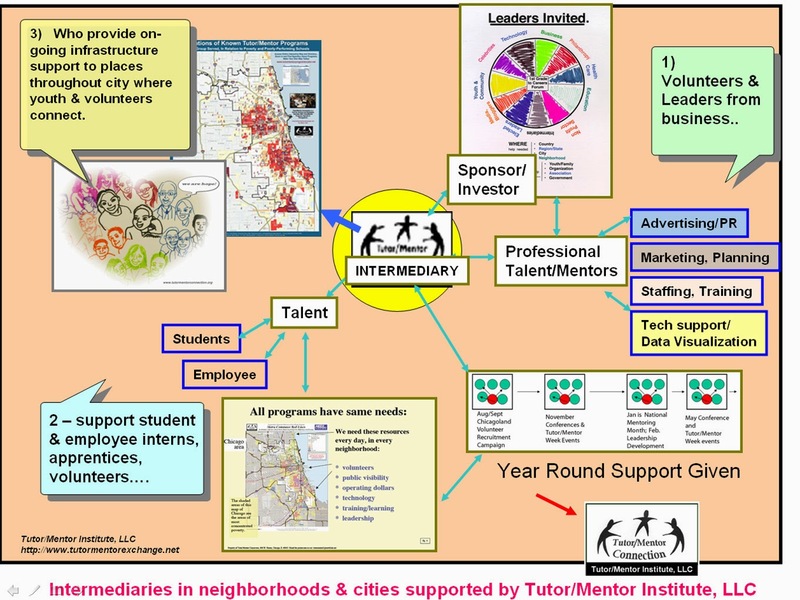 I created the Tutor/Mentor Institute, LLC to provide structure while I attempted to re-build a team of civic and business leaders who'd take ownership of the T/MC strategy in Chicago, or help build similar strategies in other cities. I've not succeeded in doing this. It is still needed. Contact me if you want to offer your time, talent, and/or dollars to re-launching the Tutor/Mentor Connection strategy. I am in the margins, dude. Thanks for the opportunities you open. So many doors if we only stand and walk. Thanks for the way you've been sharing my work with others, through your own blogs and social media. If more people would take this role, and become "evangelists/sales force" with goal of embedding my strategies in their cities, or their institutions, and, of finding one or more benefactors who'd want to put their "name" on the Tutor/Mentor Connection in their city, or on their college campus, we'd move this forward more than what I've been able to do over the past five years. Who Should Be Looking at the Tutor/Mentor Blog?